"Senator, all they seem to know is my son is missing." Of the many crimes against humanity that can be laid at the feet of Richard Nixon, Henry Kissinger and their administration, one of the most horrifying was the 1973 overthrow of the democratically-elected president of Chile, sparking chaos and death, culminating in the installation of the bloodthirsty dictator Pinochet. The extent of American involvement was, as was the case in so many instances of the Nixon presidency, well concealed. Despite some sporadic newspaper reporting that suggested American intelligence involvement, it was not until the release of this important picture by Costa-Gavras that the reality of what America had done began to sink into the mainstream. But instead of focusing on the parade of horrors, Costa-Gavras wisely makes the fulcrum of his story a very personal search by a man for his son, and a woman for her husband, bringing the politics home in stark fashion. In 1973 Chile, Charles Horman (John Shea) and his wife Beth (Sissy Spacek) are excited to be witness to the liberalization of the country, and the incipient breaking of the stranglehold of the wealthy upon the vast majority of the country. However, when Charles takes visiting friend Terry Simon (Melanie Mayron) to nearby Viña del Mar, Charles learns too much about the presence of the American military and CIA operatives for his own good. In the disruption of the ensuing coup, Charles vanishes one night when Beth is caught outside the house by the curfew. When he does not return, Beth contacts Charles' father, Ed Horman (Jack Lemmon), who after using what little political influence he has in Washington, flies to South America to try to find his son himself. Together, they try to break through the bureaucracy of the ambassadors, desperate to learn the truth about what happened to Charles. Before long, it becomes clear that the officials' unhelpfulness may not be just because they are limited in what they can accomplish. The picture is full of memorable moments, such as the grisly sight of a room with dead bodies stacked up like cordwood, or the terrifying experiences of Beth caught on the streets with nowhere to go after curfew. While hardly a cheery tale, Costa-Gavras manages to infuse an appreciation for life into the picture; there's clearly deep and abiding love from both Ed and Beth, although his affections are tempered by their vastly different political temperaments. While Charles is sympathetic to the leftists (though seemingly more or less apolitical himself), Ed is a conservative Christian Scientist who believes at first that Charles must have done something wrong, gradually coming to suspect he may have engineered his own disappearance, and only after being unable to come to any other conclusion is he able to face reality. That shift of perspective is at the heart of the film, along with an internalization of the betrayal that Ed feels as the institutions that he has believed in all his life are not only not there for him in his hour of need, but may in fact have been implicated in the death of his only son. Although I have a long-standing dislike for Lemmon's talents as an actor, which I consider grossly overrated, he conducts himself reasonably well in this role. For the most part, Costa-Gavras is able to temper his lame shtick, though every now and then Lemmon's old reliable comedy bits (bobbing his head, sniveling) sneak uncontrollably to the surface. Nevertheless he manages to get the essence of the character across in credible fashion, especially when he is able to touch base with Ed's anger. Spacek is excellent as usual, even when repeatedly called upon to be exasperated at Ed's obtuseness. The scenes of her together with John Shea work very well, with an easy intimacy that makes one believe in them as a couple and that is strong enough to fuel her fury at the officials who she believes are trying to use her as a source of more victims. Spacek and Lemmon are both at their best when pitted against each other, as personifications of faith vs. reality, with an appropriate edginess to their uneasy relationship. 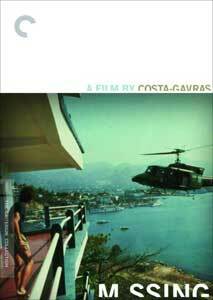 Costa-Gavras plays an interesting sleight of hand that almost goes unnoticed in the picture. While the characters come to conclusions about what has happened and why, he lets them do so. But the camera only can report their reactions, since we never see exactly what happened to Charles. Indeed, when we get several different stories from witnesses, the very same scene plays out with important details changed, so that we're clearly only seeing their (possibly erratic) perceptions of the events, not the reality of them. It's a thoughtful and Rashomon-like approach to the material, which helps keep it alive as a work of art long after the Chilean coup is history. That uncertainty is very much consistent with the theme of Missing, that not knowing what happened is often worse than knowing the worst has happened. And that applies to the wider political sphere as well as the personal one that forms the story of Missing. Image Transfer Review: The anamorphic widescreen transfer looks quitenice, with naturalistic color and solid black levels. The photography is often a bit soft in 1980s style, but that comes across well enough in the transfer, with no significant artifacting that I saw. The grain structure is preserved without any sparkliness or distracting character. It's a difficult piece of source material but Criterion comes across once again with flying colors. No damage of any kind was spotted. Audio Transfer Review: The 1.0 mono track is satisfactory, though on occasion the ADR levels are distracting. The bursts of gunfire lack punch (this isn't an action movie, after all), but dialogue is generally quite clear. The soundtrack is an often moving synth score by Vangelis, emphasizing once again that this is a picture from the 1980s. It's serviceable, but even at its best this was never any kind of aural showpiece. Extras Review: In addition to a hefty booklet of essays (including reminiscences by the real-life Terry Simon) and a green-band R trailer, the second disc offers six substantial documentaries. The first is a combination of interviews with Costa-Gavras in 1982 and 2006 (32m:26s) that provides a thorough history and 'making of' background. Joyce Hoffman on Missing (30m:19s) is an interview with the real life person that "Beth" is based upon, talking about Charles and offering a moving discussion of the events and the political background of the story. Producing Missing (17m:22s) offers interviews with producers Edward and Mildred Lewis and Sean Daniel, as well as Thomas Hauser, author of the book that was the basis for the picture. A French television show from 1982 (19m:24s) looks at the reception of the picture at the Cannes Film Festival, with interviews with Costa-Gavras, Lemmon and the real-life Ed Horman and Joyce Horman. Interestingly, Ed can't let up: when the interviewer asks Joyce a question, he feels compelled to answer it himself. Perhaps the most fascinating of the extras is Pursuing Truth, featuring Peter Kornbluh of the Georgetown University National Security Archive (19m:27s), who has made a career out of filing Freedom of Information Act requests to try to get to the bottom of what happened in Chile. His efforts have not been fruitless; among the things he has come up with (and shows onscreen) are Nixon's order to engineer the coup, as well as acknowledgment that American intelligence operatives may have contributed to Charles Horman's death. In essence, much of what is just conjecture in Missing is proven by documentary evidence to be quite correct. Particularly chilling is the information that the embassy had plans and space for up to 450 American refugees to take cover in the event of such a coup; they all, including Charles Horman, were turned away. The last documentary, In Honor of Missing is an oddly self-congratulatory 2002 presentation by the Charles Horman Truth Project, though it does offer some significant commentary from those that the film has touched, as well as another chance to hear Joyce Horman speak for herself. In all, a very thorough package that makes for essential viewing. A powerful political and personal statement from Costa-Gavras, with fine lead performances, given an attractive transfer and a solid bundle of extras.